Before Sun Tzu and Confucius there was Kuan Tzu, China's foremost geopolitical sage. He was a man who attained spiritual enlightenment, whereas Sun tzu had not. He taught ethics and virtue, which Machiavelli did not. He mastered the Tao, which shined through his political and military strategies. His wisdom protected China from barbarian invasions and saved its imperial system from collapse. Kuan Tzu, also known as "Kuan Zhong" or "Guan Tzu," served as the prime minister and advisor to Duke Huan of the Chinese state of Qi. Despite fierce competitors, in just a few short years his diplomatic and economic strategies turned Duke Huan into the richest and most powerful man in China, and Kuan Tzu unified the nation through a strategy of peace rather than war. He came many years before Sun Tzu and Confucius, who both learned from this great man's strategy guide. Kuan Tzu wrote a book on management to teach anyone how to become the richest, most powerful person in the land ... such as in a company or political organization. He taught the Taoist rules of power, management, influence and persuasion, but from an enlightened sage's point of view. His lessons can be used for marketing startegy, for management training or as leadership lessons. They are very effective, for few men in Chinese history have been granted the honorary title of "Tzu" to denote their wisdom. Despite the fact that both the Prussians and Japanese heavily relied on Kuan Tzu strategies to build their nations into superpowers, most people have never heard of this sage. This is despite the fact that Kuan Tzu was the world's first Keynesian-Monetarist! That's right ... he used Keynesian and Monetarist policies to manage the economy of his state and build it into a superpower. But he did it through policies that recognized the pragmatic existence of Machiavelli-like individuals who owuld oppose him, and yet they incorporated virtue. They melded with the Tao, or natural way of nature. Remember, as with Lao Tzu and Chuang Tzu, Kuan Tzu is one of the few individuals in Chinese history who is recognized as an enlightened sage ... whereas the military strategists and tacticians Sun Tzu and Sun Bin were not enlightened at all! Of all the sages, Kuan Tzu's words and lessons are the ones most appropriate to the Western world today and the modern times of globalization. Instead of Lao Tzu, Chuang Tzu, Confucius, Mencius, Sun Tzu, Han Fei Tzu ... KUAN TZU's lessons are the ones most needed and relevant for today's management and leadership challenges! But have you ever heard of him? The Chinese keep him a secret as knowing Kuan Tzu is the key to national and worldwide power. The Japanese, for instance, followed an incredible number of Kuan Tzu strategies to make their nation into a superpower. This strategy guide tells you how any country can do the same. Kuan Tzu's lessons are especially appropriate to the new global executives and CEO entrepreneurs who are fast becoming the new "global senators" or "global princes" with the power to shape the world for good or bad. If you want to operate in this multi-cultural world, but navigate with brilliance and ethics while achieving goals of a magnitude far beyond ordinary men, Kuan Tzu's teachings are what you need to learn. In fact, this book can be considered a global catechism and strategy primer for how individuals should virtuously act while working to accomplish their aims for the greater good. It is the virtuous man's leadership primer for the new era of globalization. And yet, you can use it as a marketing strategy guide, too! This book is the Art of War for virtuous leadership, ethical conduct and accomplishment. Forget Sun Tzu's Art of War for business ... this book is the true Art of War for business, management, leadership, power, persuasion and macro-strategy. But I warn you ... it's not for everyone. Kuan's Tzu's lessons are not meant for the ninety-nine men out of a hundred who do not have the drive to excel, to sacrifice, to accomplish, to get to the top. Nearly a dozen individuals, including six professional translators, worked on translating this book on how to become the preeminent leader of a company, nation, in fact any organization. If you want to win an election and political office, you must get this material. If you want to become the president or CEO of your firm, you need to get this book. If you want to become the leader in a powerful coalition, you must get these lessons. If you want to become a supreme leader of any unified group, you need this material. If you want to effectively manage a group of people and bring your organization to a state of premier excellence -- even of global stature -- there are ideas in this book that have never been in print before and which will open doors that might have taken a lifetime of learning and experience to attain. Why not get there in the shortest time possible by jumping the learning curve with this instruction manual? How is Kuan Tzu's work compared to the popular Sun Tzu's Art of War? Kuan Tzu was a prime minister, while Sun Tzu a military general. Sun Tzu's work on warfare was originally meant to address the military elite, while Kuan Tzu's topics were on leadership strategies meant for a king to govern a nation. Here lies the fundamental difference, both are leaders, but who do you think is greater? If you have read and applied Sun Tzu tactics and felt that something is missing, incomplete, energy draining and spiritually tired, your experiences are probably justified as most of Sun Tzu is about fighting to win. Reading Kuan Tzu will be refreshing, as Kuan Tzu focused on the forest instead of the individual trees, the big picture instead of the mundane details. If you want to be a great leader, can you afford not to be familiar with the big picture? In the various schools of cultivation, the masters often say that spiritual cultivation entails purifying and harmonizing the four elements of wind, water, fire and earth of the physical body. This idea is correct, and it's one which must be extended to a realm at large: only if a nation's internal elements are balanced can it find peace in the world. .To prove this point, we need only to think of a famine when there is no food to be found. Money is worth little in this situation because it can't be used to buy anything to eat hence it is only money's usage which defines its active value. Here we must note that there are many individuals at the top of large institutions who are not there because of exceptional skills, but because they were the ones who least offended others during their climb up the professional ladder. In other words, they were the least inimical among the contending talent, and hence the most likely to rise because of a lack of criticism and ill will. If you are making a living in the modern world, wants to do well in it, and at the same time have a strong interest in spiritual cultivation, you cannot afford to miss this work. You'll learn how to strike a balanced life and enhance your leadership talents to a level where you'll gain respect and dignity for yourself and from others. The only 2 decision-making abilities you need to be qualified as a GREAT leader ... do you have them? Why and how the right type of prior preparation and planning will avoid strategic disaster ... do you follow these systems? The particular administrative deficiencies everyone overlooks that, uncorrected, have lead countless leaders to ruin. Whatever you do, don't make these mistakes! Whether you are a local, national or global businessman or politician, these 37 lessons will teach you the necessary preparations, advisors, decision making, timing, strategy and tactics that will eliminate all the risks in your efforts and maintain your control of every situation while magnetically elevating you to a leadership position of unchallenged prominence. Forget about Sun Tzu, who focused on tactics to the detriment of strategy, and who did not attain the Tao. Learn from this enlightened sage instead. Forget about Lao Tzu, whose teachings on the Tao are just too high for most people to correctly apply and comprehend. Forget Machiavelli, who focused on power without ethics. If you really want a practical mentor who can teach you how to become a supreme leader, win an election, gain and use political power, increase your company's market share, formulate global strategy, or cultivate strategic vision ... here is your man who will solve your troubles and instruct you on the long and short term strategies you are seeking. These nearly invisible Taoist strategies will not only bring you maximum success in all your endeavors and enable your organization to quickly dominate its peers, but will rally public opinion to your favor while attracting the top talent necessary for you to accomplish all your objectives. In this new era of globalization, they are even of yet more importance because they teach how to stay on good terms with all sorts of different parties. Machiavelli and Sun Tzu operate on the negative side of behavior, whereas Kuan Tzu teaches you how to win all things through positive means. Kuan Tzu will teach you how to accomplish your aims through virtuous, controversy free, ultraethical means that will bring peace of mind, better you as an individual, produce great cultural contributions to society and win you a distinguished reputation. Think about it -- Kuan Tzu conquered countries using economics, prevented war six times through diplomacy and waged war numerous times as well, reinstalled the Emperor's position in society while elevating his Lord's own position in the land, and made his state into the richest in China. This is a man whose management lessons are worth far more than Jack Welch or Bill Gates. Whether you are talking about a global or local arena, Kuan Tzu's strategies are so much higher and more effective than Sun Tzu's strategies and his Art of War that a comparison between the two isn't even fair. When you study Sun Tzu and Confucius, you'll even find that both these individuals actually referred to Kuan Tzu and his teachings. If you want to turn your organization -- even a unit as large as a nation -- into an unchallenged superpower and unchallenged leader, and if you want to learn how to become the most respected and influential person in the land, then buy this book and learn the lessons it offers which you will find nowhere else. Oh yes, one more thing. 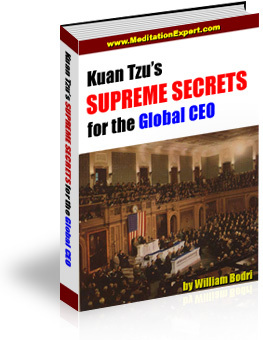 Kuan Tzu's Supreme Secrets for the Global CEO is so good that it has a 30-day 100% Money Back Guarantee. As with all our ebooks, read the information and absorb it Risk-free at my expense.